CDT starts using cache files from older configuration. Clear IE browser cache and delete manually all files under “Temporary Internet files” folder. To clear IE cache, open Internet Explorer and use hotkey combination “Ctrl + Shift + Delete”. Check options “Temporary Internet Files” and “Cookies”, and click to “Delete”. If this does not work, then write to our Support team. 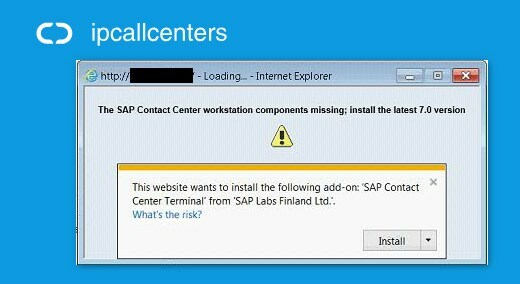 This website wants to install the following add-on: “SAP Contact Center Terminal” from “SAP Labs Finland Ltd.”. Ensure that there has been no changes to the workstation (e.g manually installing the terminal components). Ensure your IT has not sent down a new Group Policy to change, that would revert the IE settings to enable optimum operation of the client components, and if so, please make adjustments accordingly to avoid this from happening. How to use Multiterminal Desktop (MTD) Function? 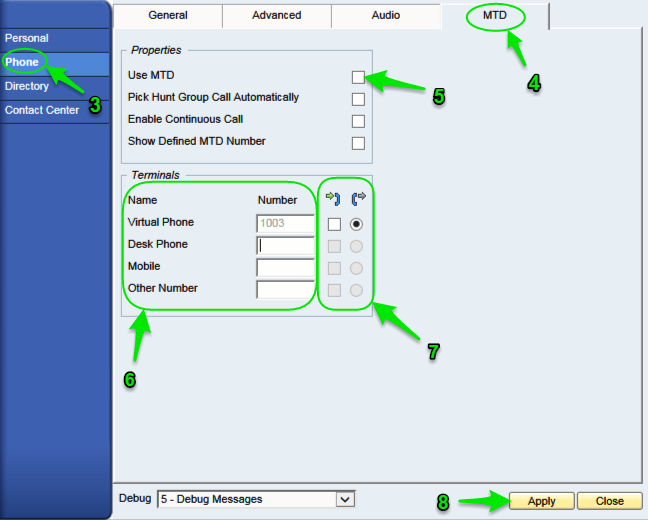 MTD is a function that allows you to define multiple terminal audio devices for receiving inbound calls and one device when making outbound calls using CDT. Note that the MTD device is used as an audio device only. A call arrives to a queue and is accepted by the system. The call is then allocated to an agent which indicates in their CDT and IP desk phone. The agent answers the call using the IP desk phone, and the call is then connected with the customer call. In this example, the call control stays in CDT and the IP desk phone is used only as an audio device and not as an IP desk phone. A marketing agent is working from home with a VPN connection to the corporate network. Because the data line is too limited for audio, the agent uses mobile phone as an audio device instead. The agent enters the customer number into the CDT number field and clicks the Call button. 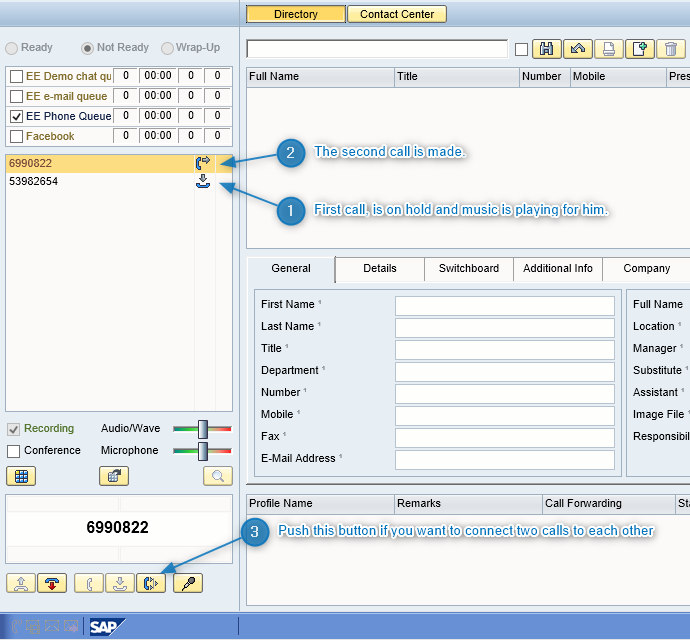 SAP Contact Center creates two call legs. The first call is to the agent’s mobile phone and the second call to the customer. The agent picks the first call from the mobile phone. The first and the second call are connected, and the agent is able to use the mobile phone as the audio device. Virtual Phone – it is user’s extension number. This can be changed only by system administrator, you are not able to do that. Desk Phone – While you use Desk Phone with CDT, please add here the number of it. Mobile – While you use the mobile phone for calls in CDT, please add here the number of it. Other Number – Please do not use this value if our support hasn’t told to do so. To activate changes, click Apply -> OK.
Those instructions are for managers or team leads, who have necessary rights for campaign settings. Open the System Configurator (SC). Choose from left menu the Campaigns and from right push to Search. Pick the similar campaign from results and make one left click on it. Now choose Copy from upper menu. If you won’t need to change anything, just push Save and Close button. If you need totally new campaign then please change Campaign template, Call results, Redialing settings and visible number etc. How to import contacts to the campaign? While you are preparing at first time to import, use the campaign export to get the template for it. 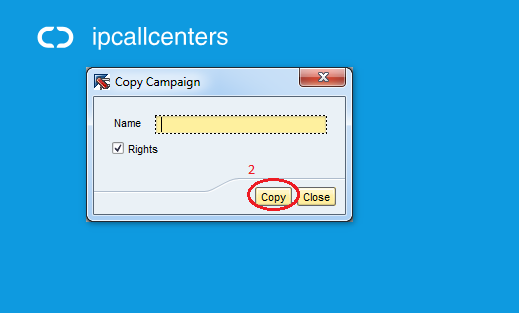 If you have empty campaign you may choose export to get empty example file for importing contacts. To export contacts open SC-> System Tools -> Export and fill the cells as shown on the picture. Fill the row “Exported from Campaign” with the name of a new, created campaign. How to import the exported fail back to campaign? The procedure for importing is always the same, at first time and in the future while you are adding contacts to the campaign. Please see the picture below for instructions. Please be patient while the import is processing and check afterwards if the import was successful. It is important to push Pause button in Campaign list in SC before you start import job and afterwards you need to activate campaign by pushing to Start button. The call is transferred directly, and you do not know whether it is answered or not. The call is processed according to the queue configuration if there is no answer. For example, the call can be forwarded back to the original queue or to some other queue. The call is processed according to the presence management if there is no answer. For example, the call can be forwarded to the user’s mobile phone, if the user has activated such a profile. You have selected one call to be Private. There is only one call left in the conference call. In this case its status is irrelevant: it can be Private, Public, or Muted. You wait for the person to answer before you transfer the call. The first call is on hold when you make the second call. If the second call is answered, you can connect the calls. If there is no answer, you retrieve the call that has been on hold. Enter the number of the second party into the destination field. Click the Transfer button or use a shortcut key. The call is cleared from your contact list. Enter the number to which you want to transfer the call and click the Call button. The first call is automatically put on hold. When the second party answers, click the Connect button or use a shortcut key. The calls are cleared from your contact list. Where to find transferred call, depends on the method of transfer. Using the Blind transfer, you can search the call under the History tab of CDT, and see the original A number as a caller. If other methods are used, the transferred call is a separate call and is not shown under CDT History tab. To find made new call, please use Online Monitoring’s Contact View. Online Monitoring can be opened by all users, clicking on File -> Online Monitoring or typing at the end of CDT link the “monitor” instead of “cdt” (http://customername.ipcallcenters.eu/monitor). 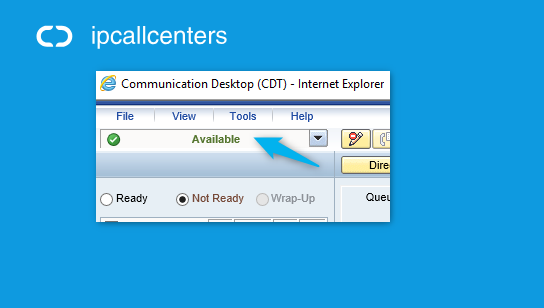 While you use MTD functionality in SAP Contact Center system, you have desktop phone on your desk. Restart your phone, by removing internet or/and power cable and put back to the right port. If no help, use another wall outlet of internet cable, it means, try to change the physical location of a phone. If it helps to solve the case, probably your office network parameters has changed. For example the IP address has been changed recently. If it is so, please send us your new IP address, by contacting our support team. To find your computer’s extrernal IP address, please use this link. If the phone has picture on screen and tone while you pick-up the handset, but won’t ring if someone calls and always replies with Busy tone for caller, then most probably the reason is that you have forgotten or activated by mistake the DND (Do Not Disturb) function from your desktop phone. Please check if you can see the DND icon on the screen of the phone. Unfortunately different models have different instructions for deactivating of DND, so try to use menu buttons of a phone and try to find the right place :). If those three suggestions won’t help, the cause may be in Phone Service Operator network. Please contact your Phone operator and also contact our Support team. 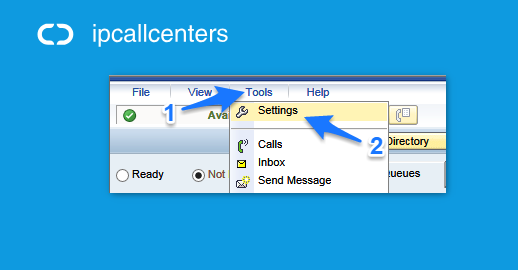 How to get SAP CCtr CDT’s shortcut to your desktop? Need CDT shortcut to your desktop? You start to open the CCtr CDT window as usually and the error “An error has occurred, please restart your workstation” jumps up. This error means that SAP Contact Center installation has not finished properly, there is a need to open Internet Explorer with using administrator account. Please contact your IT department to help you, but if the problem occurs, notify our Support team. 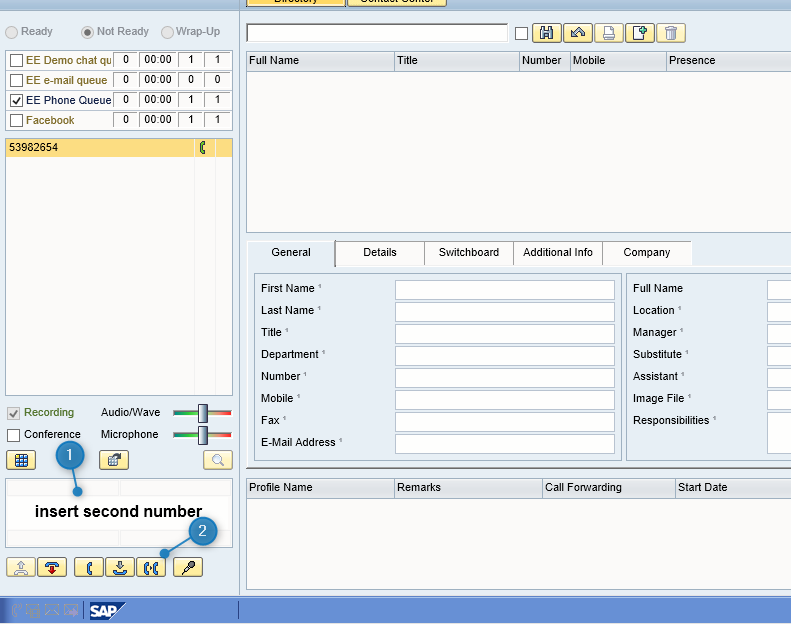 After login to SAP CCtr system the agent is not able to answer contacts. If everything is as shown on screens, but user still unable to get active incoming contacts, please contact our Support team. How to get call’s audio file? Your customer is agree with automatic recording of all their calls in SAP CCtr and you need to get audio file from SAP Contact Center, to listen it outside the SAP system? How to get the file? Listen the file in CDT (opening it from Online Monitoring or from History view in CDT). After the file is played, open File Explorer window and type “%temp%” to address field or go C:\Users\’your_user_name’\AppData\Local\Temp. Copy the latest audiofile. The file name is changed to range of letters and numbers for security reasons (it seems like – FF74B6EC4F28E81180C6062922B38F2F). Other option to get the file, is to wrote our customer support an e-mail, sending us the call’s A and B numbers, timestamp and we’ll send it to you. Phone call audio is bad and you hear the robot voice? The cause of a robot voice might hidden in the office network. Technically speaking, the probable cause of a situation is a packet loss, the overload of the connection. Please ask your IT department to check the network connection settings and quality. While the situation continues, send detailed info and workstation log files to our Support. While the audio volume level is very low, or there are still echo in the voice, change Volume settings of a CDT. Audio/Wave– is the volume level for headset/speakers. Microphone– is the volume level for microphone and if it is set to high, the microphone audio can be heard also in headset. Agent can’t hear the customer or/and customer can’t hear agent- there is an one-way audio in a call conversation? 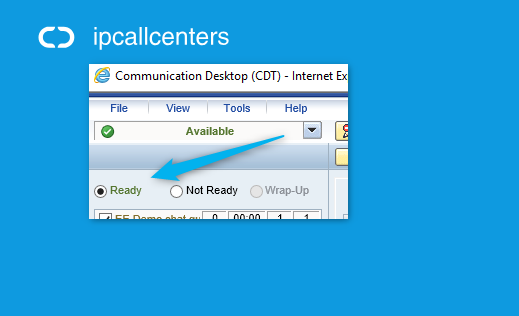 Ask colleagues if they have the same problem with calls, using SAP CCtr. If most of users have the same situation, please contact your phone service provider (if it is not also us) and send us a detailed description of the issue and add log files from one workstation. The cause may be equally in our or in phone service provider responsibility. 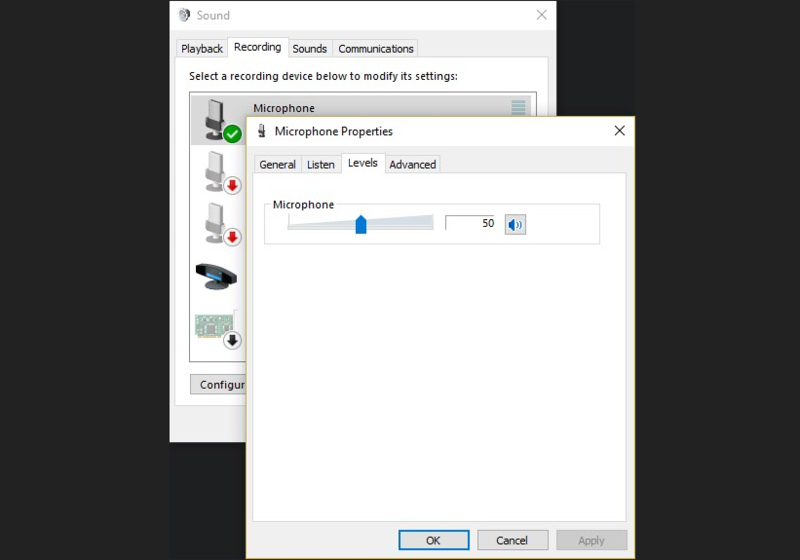 Check if your microphone/headset and audio devices are working and not muted. Additionally please check if the SAP CCtr audio and microphone volume is not set to too low level. It is recommended to keep volume level in the middle of volume bars (please see the picture below for the explanation). Is SAP Contact Center GDPR compliant? GDPR protects the personal data and data privacy of all EU residents. Personal Data means any information related to a natural person (Data Subject) that can be used to identify the person directly or indirectly. Like a name, photo, email address, bank details, posts on social networking websites, medical information, IP address, or similar. GDPR enforced on May 25th, 2018. As a result it gave consumers more rights, while obligating the service providers to implement new processes and policies. A software product in itself does not make an organization GDPR compliant. For example, internal processes may need to be changed to be compliant. As from SAP Contact Center v7.0 FP12 enablement of the GDPR processes, such as right to access, right to be forgotten, data portability are achieved from the newly added role of “Data Protection Officer”. Here you can find a compact overview about changes and functionalities regarding the GDPR processes in SAP Contact Center v7.0 FP12. Do I have the latest version of SAP Contact Center? To find out open the CDT or Online Monitoring and click Help -> About. There should be version info: SAP Contact Center 7.0.12.0. What should you do to get right version of SAP Contact Center? Please contact your sales manager or write directly to our support e-mail support@ipcallcenters.eu. Use our suggestions to start troubleshooting by yourself. Before you send us the query, please read and open this short overview about main functionalities of a SAP CCtr and maybe you’ll find your answer right away by your own. You have identified a problem with your SAP Contact Center (previously BCM) system and wish to report this to us. Restart your laptop or desktop computer. Test if you are able to log in with your SAP account in your colleague’s workstation. Test if your colleague’s SAP account is working properly in your computer. With SAP CCtr system itself. Maybe our support has recently contacted you about maintenance works or the software version upgrade was placed recently. If so, please contact our Support by writing us an e-mail to address: support@ipcallcenters.eu, or call to the No: +372 699 9099. With your office network. Please consult with your IT department first and if you still can’t find the solution for your case, please definitely contact our support. With your personal laptop or workstation. Maybe there was a notification on your desktop in the morning, about the upgrade of your workstation software? If so, please try to Restart your computer and if you are still not able to log into SAP or other difficulties with SAP system, please contact with your IT department. Ask if they know about changes made recently and if still no help, give us the detailed description about the appeared situation by sending us an e-mail to address: support@ipcallcenters.eu, or call to the No: +372 699 9099. How to find workstation logs? A detailed description of the issue is mandatory, but providing the correct supporting workstation logs for the reported issue is essential for troubleshooting. Please open File Explorer window and start typing into address field ‘%temp%’. Now push the Enter button and search in opened catalog all files which look like this – ‘ContactCenter_CDT_YYYYMM… .log’ (please click on the picture). If the name is totally the same, choose the newest files for sending. For sending log files it is better to compress files as archive file ‘….zip’.